Over the last two weeks, more than 17,000 fans around the world logged onto DCI.org to select their six favorite corps performances amongst 72 World Championship Finalists from 2004-2008. The first round of online voting narrowed the field to 12 finalist corps. During the second round, fans had the opportunity to select the six corps performances that will be shown up on the big screen when Drum Corps International's "The Countdown" comes to select theaters on Wednesday, May 13. View the complete voting results below. Remember only one performance per corps could be selected for the program. In column one, "Finalist" denotes those who made the first-round cut, and "Fan-Selected Performance" in column two notes the six corps that fans have chosen to see in theaters this May. But the fun and fan-interaction doesn't end there! During the theatrical broadcast on May 13, audience members will act as judges, using special score sheets downloaded from the DCI Web site to rank and rate the performances. 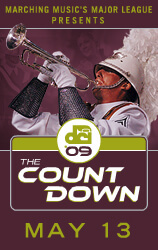 Following the in-theater event, you can return to DCI.org to submit your scores – the corps receiving the highest marks will be awarded bragging rights as the "2009 Countdown Champion." A complete list of participating theaters will be released in the coming weeks, and tickets for this year's "Countdown" will go on sale starting Friday, April 10. Visit DCI.org/countdown for more information!